With the rise of social media comes the rise of social influencers. Influencer marketing is growing so rapidly that it could be worth $10 billion by as soon as next year as brands recognise the need to deploy more capital to this type of advertising. This industry is worth serious investigation as an investment opportunity, especially when you consider that, seven out of ten marketers were boosting their influencer marketing budgets last year. And it’s a space that’s still has significant growth ahead of it delivering the best return on investment for advertisers in digital media. While still growing, the space has seen some a number of big deals. Last year Quotient Technology Inc. acquired Ahology in a deal worth up to $50 million, while Viacom acquired Whosay for an undisclosed sum, its second purchase in the space. Even the New York Times has got in on the act, acquiring HelloSociety for $12 million. Today’s company, led by a former MySpace executive and with the founder of MySpace on the Board, is cashing in programmatic advertising and on the rise of influencer marketing. With a ten year history in digital advertising behind it, and given the recent movement in influencer marketing, it is no surprise that this ASX junior is throwing its hat in the ring. The company buys digital ad space, then wraps it with significant value, and sells it with a markup. Revenues are taking off — daily average programmatic revenue increased by 323% from the start of January to the March quarter end. Further still daily revenue grew again in the first seven days of the second quarter by another 228%. 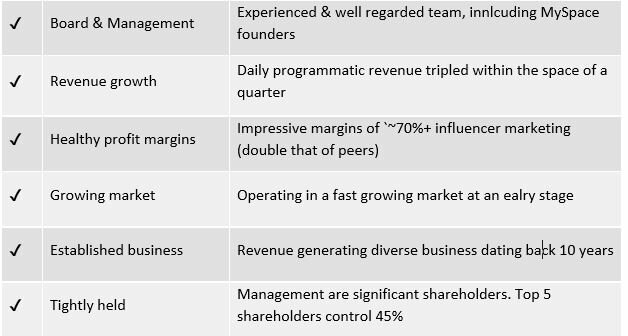 Also worth noting is that margins are more than double of what the industry’s leading companies yield and these could improve further with the company now moving into the cannabis space and CBD advertising space, which enables cannabis advertisers to acquire digital ad inventory. Yet it seems that the market may just be starting to recognise the potential on offer here. After hitting a low in January the stock has reversed its downtrend, and tripled its share price, no doubt backed by this impressive revenue growth. 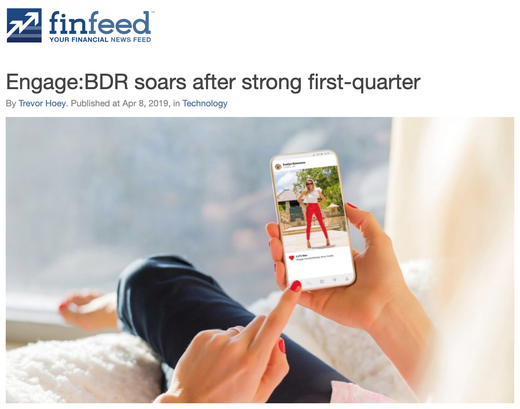 Programmatic advertiser engage:BDR (ASX:EN1) has proprietary technologies that automate the transaction of digital video, display advertising and, most recently, influencer marketing for advertisers, agencies and publishers which display these ads. The value-chain has collapsed in the sales side of digital advertising; the supply-side is now due for optimisation. EN1 is embracing artificial intelligence to eventually optimise all digital advertising transactions. The new Ai-based advertising model has compounded industry ad spends, revenues and value for advertisers, globally. 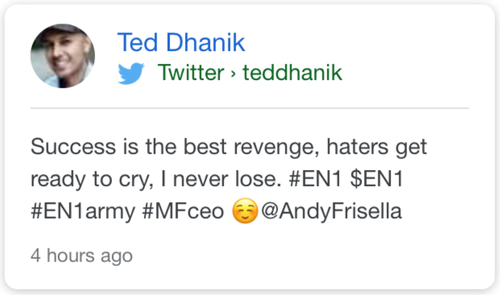 The company was born when Dhanik began looking for more efficient and cost effective ways for MySpace to handle its ad inventory. Dhanik worked with MySpace.com from 2003 to 2008 developing strategic marketing initiatives. EN1 acts as an intermediary between advertisers and website and app publishers. It consolidates advertising inventory (video and display content); automating the sales channels and workflows for advertisers and publishers; and offers precise targeting capabilities at significant scale to advertisers. The group’s first product — non-programmatic display advertising sales business, which involves tag-based banner advertising campaigns run for direct advertisers, launched in 2009. These advertising campaigns were purchased and sold manually with expensive sales people, paper contracts and 6+ month sales cycles, which was both costly, political and inefficient. In 2014 and 2015, the company began developing a “programmatic” platform to buy and sell advertising, making the process significantly faster, more cost efficient and exponentially scalable. In December 2015 EN1 launched its own video-ad serving platform eliminating third-party dependency and dramatically reducing operating costs. This video advertising, think the short 15 second or so clips you see on YouTube, make up a large share of the business today. Yet the fastest growing, and highest margin, space appears to be influencer marketing. 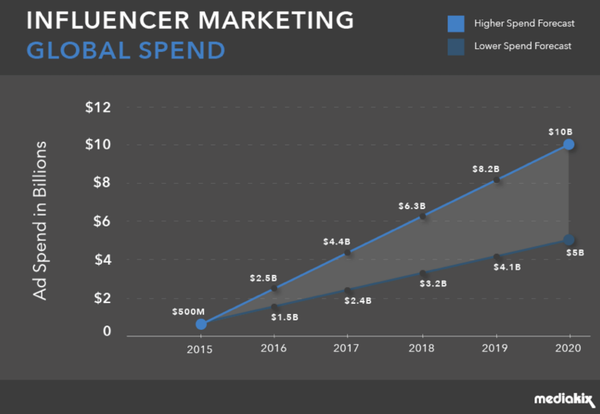 Influencer marketing is a new and emerging area of growth in advertising globally and it’s growing fast as brands deploy cash away from other areas of their marketing budgets. While relatively new to the space, EN1’s influencer marketing, like the programmatic advertising arm of its business, is growing quickly and has been key in the company’s recent strong performance. IconicReach is EN1’s Instagram influencer self-serve platform, which the company want to grow into the largest marketplace focused on advertiser-supplied creative, creating a scalable and efficient revenue stream for micro and macro influencers with large audiences. Influencer marketing on Instagram will be worth $2.38 billion this year, say Statista, up from $1.07 billion in 2017. That context supports claims that 2019 is expected be a breakout year for EN1’s platform, with several thousand influencers and at least 25 brands to become part of IconicReach. 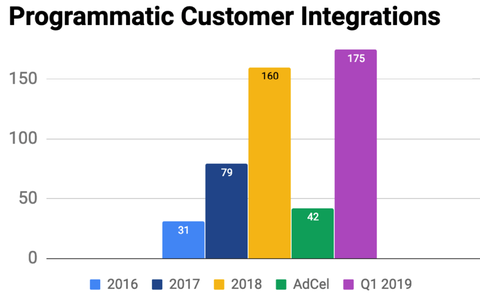 EN1 currently has 175+ client integrations in its platform and 40+ in its AdCel subsidiary and has many additional integration contracts executed and client platforms being integrated, and a further 65 potential clients in its business development pipeline. The company has also has established direct relationships with many of the top 1000 sites/networks/apps. It has relationships with top-tier advertisers, demand side platforms and publishers in more than 30 countries. There is certainly upside potential on offer here for EN1 and early stage investors. 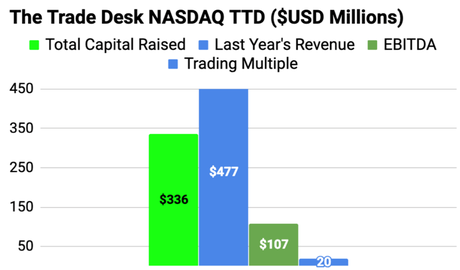 Taking a quick look at the big players in the US and we come across digital advertising firm, the Trade Desk (NASDAQ:TTD). This is a company that has a US$9 billion market cap and is trading on 20x its revenue. A comparison with EN1, with its $11.5 million annual revenue, which translates to less than 1x revenue, gives some insight into the potential upside of the company. 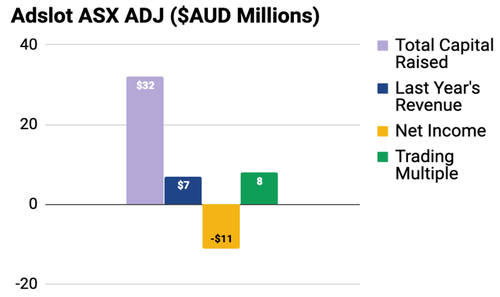 Adslot (ASX:ADJ) is another publicly traded digital media company that is trading on a much higher revenue multiple, at 8x revenue. There are also a number of private deals that placed great value on digital media companies (revenue multiple circled in green). This is indicative of the market’s anticipated future growth potential. The company has had a big start to the year with revenues rising and investor sentiment swinging in the right direction. After reporting, in late January, that it was raising working capital to activate publishers to contribute to revenue for its programmatic advertising exchange, EN1 successfully raised A$700,000 in a placement to existing shareholders and shortly after, a draw-down from its existing convertible notes facility of US$720,000. The capital was to activate partners which were strong contributors to EN1’s programmatic business over the past two years. The most recently activated publishers have been partnered and integrated with engage:BDR since 2010, when the company was one of the first in the global digital advertising industry to develop its own programmatic technologies and deploy a self-serve demand-side platform for performance marketers, direct-brands and their agencies. This first group of publishers to be activated required about A$1.1 million, which was quickly deployed during February and all publishers are now actively producing revenue. Management decided to deploy this capital early in the year to generate more revenue and it understands the capital will take longer than a quarter to return. EN1 updated the market on its revenue growth on April 1. It explained that the company was seeing much stronger demand than previously anticipated, and it expects continued scale. That update reported that the activation of publisher integrations through a deployment of A$1.1m, initially yielded US$20,000 per day (or ~A$28k). That update was followed a week later with a further update outlining the first quarter’s performance and the performance in the early days of the second quarter. The regularity of these updates is encouraging, not only in the figures alone, but it speaks to management’s transparency — keeping shareholders in the loop is always appreciated. Quarterly programmatic revenue scaled significantly stronger than management had expected. The average daily revenue over the quarter came in at around A$48,000, which was about 323% greater than the daily average at the start of the same quarter. Furthermore, these average daily revenues were about 212% of that of the December 2018 quarter. This represented the strongest quarterly close for the programmatic product in the past 12 months. And since the quarter end, the revenue growth continued. The first seven days of the second quarter again yielded healthier operating results than expected. Up another 228% on the first quarter daily averages, this has been the strongest start for the programmatic product to any quarter in company history. Here’s a look at the first quarter figures from Finfeed. 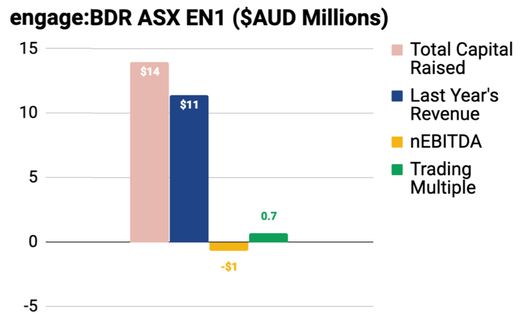 Now I’m under no illusions that a couple of good quarters makes a company, but if EN1 can sustain revenue momentum like that investors will have plenty to celebrate. And so far, during the second quarter, it seems to be sustaining that momentum. Add to the extremely impressive profit margins on the most recently activated publishers. The following graphic explains the company’s financial model. It’s also worth noting that the company founders hold 39% of company shares, with a huge 60% help by the top 20 shareholders and the top five holding 45%. This includes Ted Dhanik’s 15.3% shareholding — a clear endorsement of the company and its prospects. In early April, ENI entered the cannabis market, but not in the traditional way. 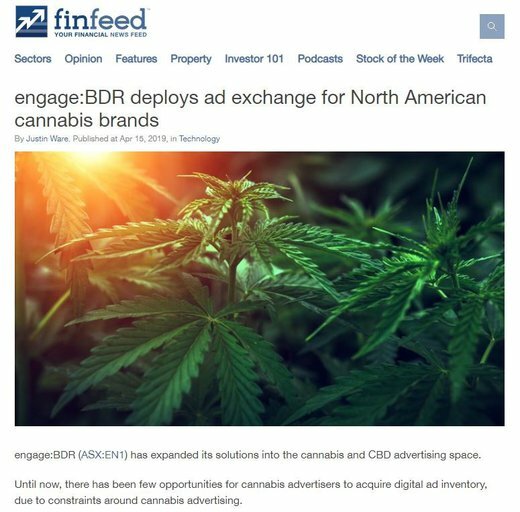 Seeing a niche that circumvents constraints around cannabis advertising, EN1 has enabled cannabis advertisers to access its programmatic exchange. AdCel is now exploring the possibility of expanding cannabis and CBD advertising to include mobile ads through a self-serve marketplace. Now add IconicReach to the mix. IconicReach will provide cannabis brands access to prominent influencers who are subject matter experts, to help create and distribute content across their social media channels. That’s ENI’s programmatic advertising and social influencer arms working holistically to enhance the cannabis advertiser’s experience. Brands will also be able to syndicate their high-quality influencer content across programmatic media channels, providing the company with a unique differentiator amongst their competitors and tremendous value to advertisers using the platform. EN1 will also deliver revenue updates with regards to the recent publisher activations and the second group, which is due to start in coming weeks. Management expects to update the market shortly on the progress of the StartApp programmatic buyer integration. Additionally, developments regarding the integration of StartApp, as well as trading updates could potentially provide further share price momentum. There are three distinct areas where marketers spend their digital media budgets: programmatic advertising, influencer marketing, and programmatic social ad buying. Already operating in the programmatic and influencer marketing ecosystems, the addition of a social ad buying platform would significantly enhance EN1’s product suite. To arm itself with this triple threat, EN1 is conducting due diligence on programmatic social ad buying companies to possibly acquire in 2019. This could significantly increase revenues even further and expand the range of digital media products and service offerings. Clearly, there’s plenty to keep an eye on and with the company trading at just 4.4 cents per share, for a $20 million market cap, there remains plenty of upside on the table.